I'm sorry for the quality of these photos. I don't know how to take night photos yet don't like the harshness of the flash, and I didn't want to turn dinner into a photo shoot session. 1. 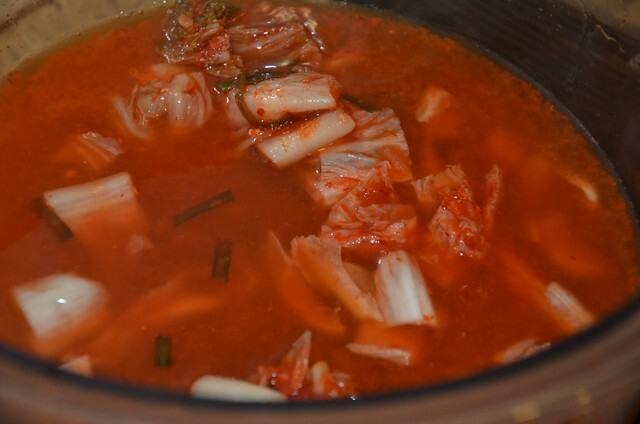 Put a cup of sliced kim chi into a claypot or glass/ceramic pot. Add enough chicken stock (or water + 1 chicken stock cube) to cover. 2. 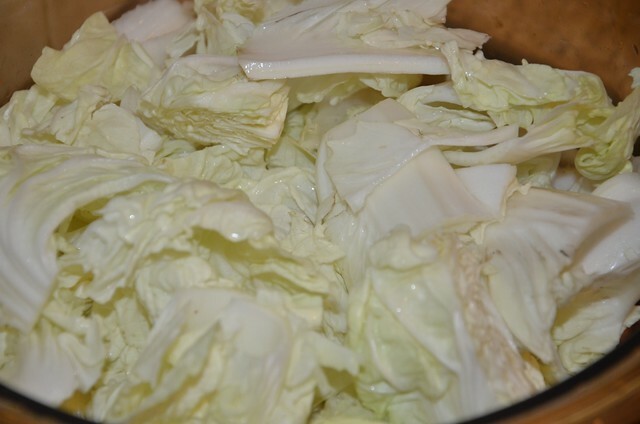 Add sliced Chinese napa cabbage, cover and boil about 10 minutes or until cabbage is nearly the texture you like. 3. 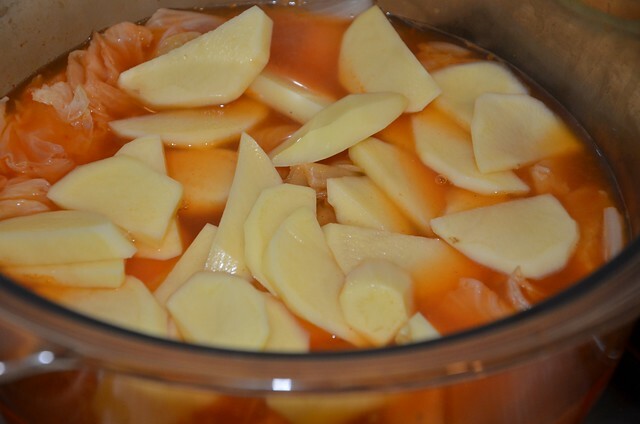 Add two sliced potatoes. Cover and boil 5 minutes. 4. 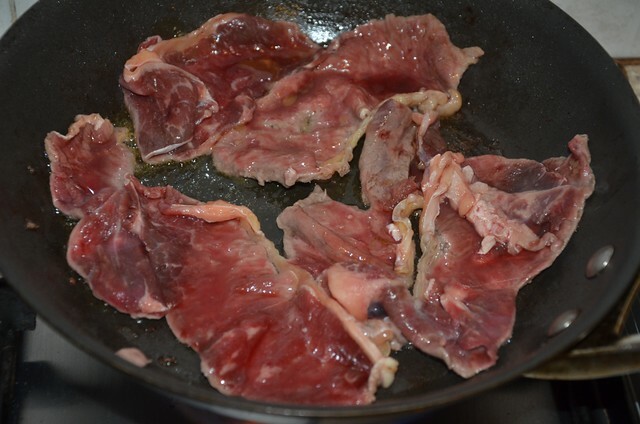 Meanwhile, sear 1/2 kg thinly sliced (these weren't thin enough) sirloin on both sides quickly. Sear the beef in several batches, each time using about 1 tsp butter. Do not cook through. Remove onto plate. 5. 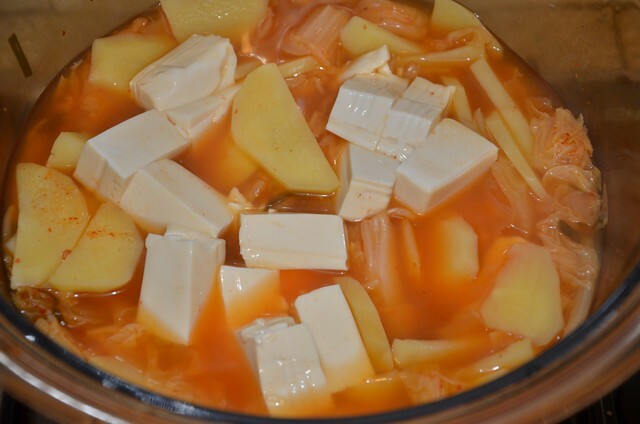 Add about 2 cups soft or semi-soft tofu to the soup, scattering them over the soup evenly. 6. 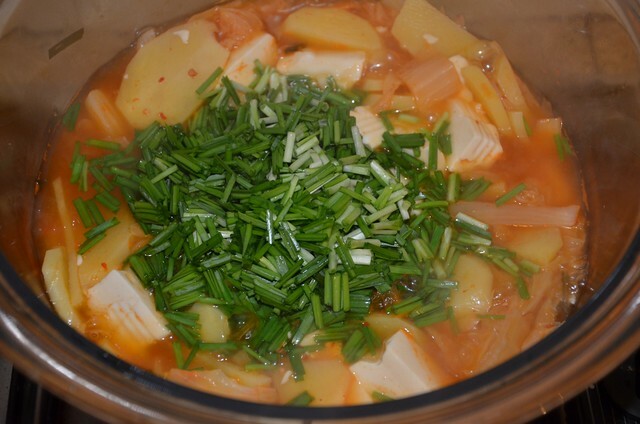 When the tofu begins to boil, add 1 cup of chopped chives (these were from my garden. Chives are perennial so do grow some at home), spread them over evenly and cover. Taste and season with salt and white pepper. 7. 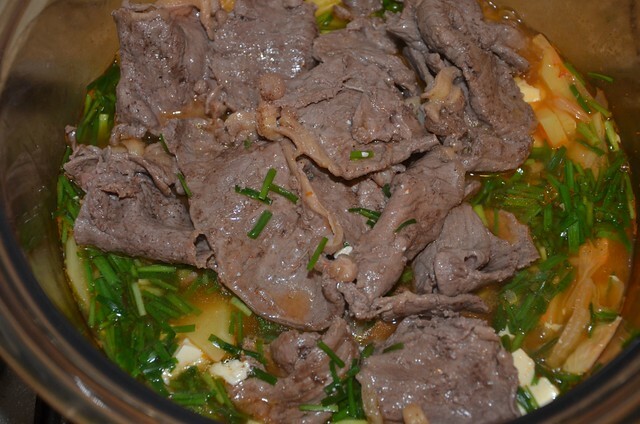 When the soup boils, switch off the heat and add the seared beef. Serve the whole pot at the table. 8. 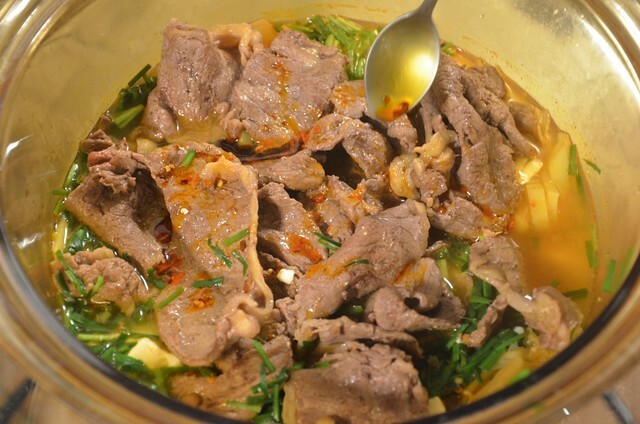 Drizzle some chili oil on the soup and eat with plain boiled rice and another dish, such as a fried fish dish. Wey pronounced the soup perfect and motherhood was worthwhile again. Btw, Wey said MasterChef Malaysia is an awful and embarrassing show. Any thoughts, anyone who has seen it because I haven't. I watched Hell's Kitchen for the first time last week and I enjoyed it and was happy that Paul, the underdog, won. To be honest, I avoid reality food shows because they are so...staged. I've only watched MasterChef Australia once, the finals between Callum and Adam, and I only watched it because my friend Elaine kept calling me when the show about to start so we sort of watched it together in our own houses but with our handphones to our ears. Guess who got all the answers right? Wey. He named all the fruits and sauces (except for Romesco sauce, if I remember right) and he didn't even have to taste them! Wey is right, Masterchef Malaysia is so awful. You are right , I do not like to watch that show. My hubby like it very much cos' he can not fry an egg. 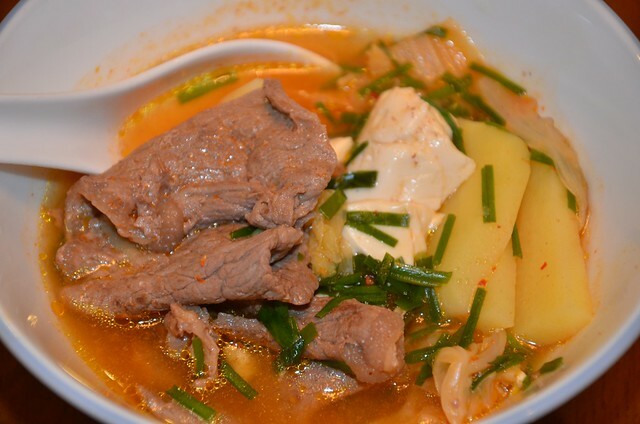 your soup like so hot and spicy. Will try it soon. For someone who has been following Masterchef Australia avidly (sadly not this year since I've relocated to KL), Masterchef MY is supremely disappointing... Did you know they even had a Maggi Kari challenge?! This soup looks simply enough yet tasty!! Gotta try that one day! And btw I've added you to my blogroll :D Just gone back to blogging again but now concentrating on food. I watched a brief part of MasterChef Malaysia on YouTube. hmmmm... Can't say that I'd recommend. Couldn't agree more, Masterchef Malaysia is a big let down. Thre's no wow factor at all. YAWN!!! One of the judge cheated his resume,what a shame. AustraliA Junior Masterchef is 100 times better. I've ordered pork belly for my next grocery delivery. Unfortunately, the Asian supermarket is all out of Kim chi. Can't wait to try your previous recipe. BTW, I tried watching Malaysian Idol via YouTube. It was so bad that I just couldn't bear to continue after 3 mins! jess: yes i read about it too. masterchef msia is just a reflection of how substandard everything is in this country. jayne: i don't know. it takes quite a lot of hard work to be a good chef n he's not been the hard working kind. ayden,mg: what a shame to all of us who can cook better than maggi mee! ccc: yes so far the response is "it makes me cringe to watch masterchef malaysia"! Masterchef Malaysia is so wrong, on so many levels. Just watched the episode where they stuffed squid with Maggi Mee (yup instant noodles). To top it off, the dish was accompanied by a petai sauce made from a sachet of Maggi sambal tumis. And to think that a Masterchef US contestant was culinarily stoned to death by the show's judges for using canned tomatoes. tt is just disgusting, mee stuffed into squid. i've done rice in squid before but mee?? and maggi mee? forigve me but i dislike maggi mee bc the texture is too soft. really, about the tomatoes? why ever not canned tomatoes? i like the ones from italy. they are good for sauces n stews and cheaper than local fresh tomatoes!